I was working out in the basement, when I saw the stack of records that I retrieved from my mother’s apartment after she had died. 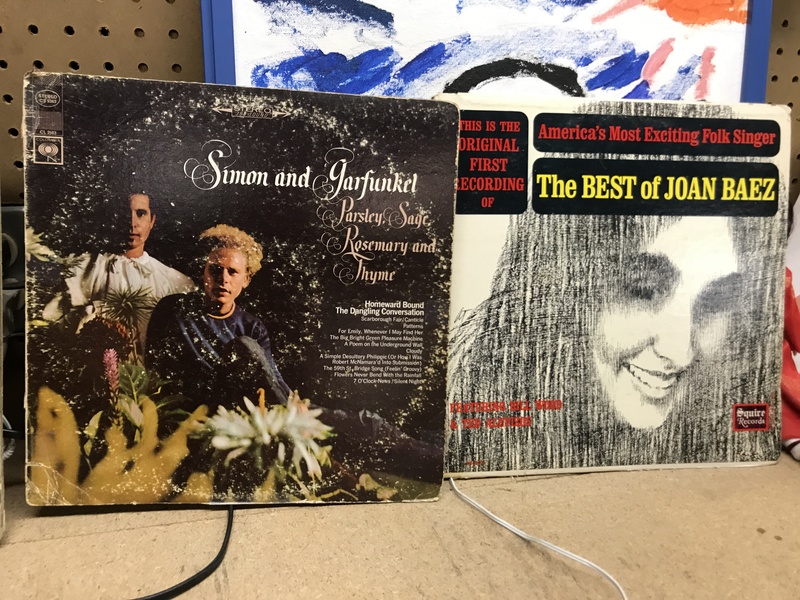 I played the Simon and Garfunkel, The Moonlight Sonata, The Herb Alpert Whipped Cream and other Delights (On my list of the top 10 American albums of all time). I love the grainy sound, the rhythmic, repeating, scratching of the vinyl LP. I love to start sentences with ‘I’ because I don’t follow anyone else’s rules of style. I’m not a writer, I’m a critic. I can do whatever I want. I pick up ‘The Best of Joan Baez Album’ from 1963 and I take it out of the Album. I place it on the spindle with great care. Then I go to ‘auto’ so I don’t scratch it. I don’t talk about my mother often. She was a feminist, old school New Deal, JFK, Gene McCarthy, liberal, Unitarian. She sat in the lunch counter protests in North Carolina back in the late 50’s. But, she came by her beliefs sincerely. I remember my mother and dad putting on these great dinner parties for the other professors at the University. My dad was chairman of his department. He was a WWII Veteran. They all revered him. He started out as an Archeologist/Paleontologist before he drifted into Anthro and Sociology. My mom was an Anthropologist. Sure Soc. and Anthro. were irrelevant until we started screwing around with other cultures we couldn’t comprehend, then Soc. and Anthro were suddenly relevant again. Oh Well. I remember my mother singing ‘On the Banks of the Ohio’ when I was a little boy in Cooperstown, Oneonta, Ithaca. Joan Baez has such a crystal-clear, haunting, brilliant voice in this rendition. She’s much better than you can ever imagine if you have not yet heard her music. I remember listening to this very same album ‘Oh! What a Beautiful City’. I hadn’t heard the song since forever. It brought me back to those idyllic days when we were a respected united family with a great upstate New York house. I must mention finally, ‘So Soon in the Morning’ with Bill Wood. It brings away all the despair and hopelessness we have from time to time. I wish I had listened to it more often and I wish I had remembered my mother more fondly before it became too late. I wonder, will my daughter have some memento of me many years in the future? Will she remember me fondly? I don’t know. I sit here in my musty basement gym, listening to the final grainy rhythmic scratching as the Album comes to an end.